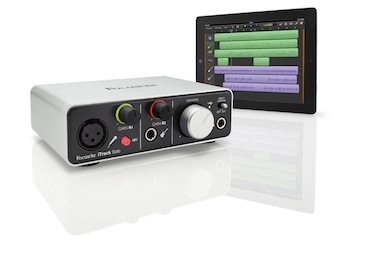 Focusrite’s iTrack Solo is thier second new offering of the day and brings the iPad into the interface fold with the same preamps as found in their Scarlett and Saffire interfaces. It features recording at sample rates up to 96kHz and 24 Bit Resolution and is housed in the same aluminum case as the Scarlett 2i2, but in a fetching silver finish. High-quality award-winning Focusrite microphone input. Made for iPad. Compatible with Mac OS X and Windows. Direct connections for microphone and instrument. Signal halos for level and clip indication. Connect directly to a loudspeaker system via rear panel phono connectors. The Pioneer XDJ Aero is an excellent new Wireless DJ controller and this week we’ve had a visit from thier chief demonstrator Rob Anderson, who took us through the many features including the use of the Rekordbox APP for Android and Apple smartphones and Tablets, as well as Windows PC’s and Mac. We were extremely impressed by the build quality and slick operation of the Pioneer XDJ Aero, although it does “stream” from wireless authorised devices running the Rekordbox app, it has a 10 minute buffer, as well intelligently automatically using the bpm (set in rekordbox) to put the track into a 4 bar loop, if the worst happens, if your mobile device runs out of battery and it does run out of tunes! The build quality of this device was fantastic, with a welcome return to the solid metal cue and start buttons that CDJ users will be used to, as well as solid metal, touch sensitive platters. The mixer is switchable between standalone and wireless mode and is exactly what you would expect from pioneer’s top level of equipment, solid, smooth and built for the heaviest level of fader abuse that you could possibly manually throw at it! One really nice feature was the lockable fader caps, to stop the frequent “flying fader” effect, where after some energetic movements, the caps shoot halfway across the dancefloor, leaving only little metal stumps for the next DJ. The idea behind the Rekordbox app is that you can sort out and beatgrid, cue and edit information for your tunes on the go. I found this a MAAASIVE plus point, as there’s many times whilst stuck on many forms of transport, that i really wished that i could sort my tunes out quickly, this does not only do that, but also allows you to stream directly to the unit to mix the tracks. I can see the Pioneer XDJ Aero as the perfect home practice tool for people who use CDJ-2000’s in clubs, and currently move thier library about on USB pendrive. This controller definatly sits alone with a unique way of working that will be incredibly attractive to users who embrace modern technology and methodology.